Until recently, this branch of artificial intelligence (AI) had been too resource-intensive for all but the largest firms to deploy, as it required specialized infrastructure and the expertise of teams of data scientists. Smaller companies simply didn’t have the budget or capacity to realize benefits from this category of machine learning (ML). Now, however, Intel is set to democratize deep learning through the recent purchase of Nervana* technology. The Intel® Nervana™ platform for deep learning enables businesses to quickly and efficiently develop and deploy custom, highly accurate, enterprise-grade AI solutions. The Intel Nervana platform for deep learning is available in two deployment options—the hosted Nervana Cloud* or an on-premise solution. 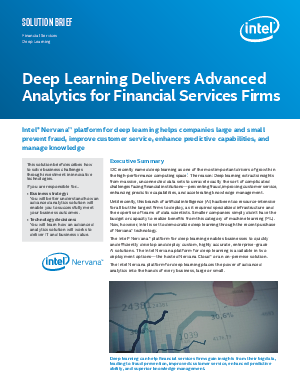 The Intel Nervana platform for deep learning places the power of advanced analytics into the hands of every business, large or small.